Pine Haven Christian Communities - Servant hearts, caring hands, inspired living as you age. Our people have servant hearts, with a passion for providing compassionate care to the seniors who live here. We were founded by 18 county churches, coming together to serve God by serving our seniors. Servant hearts, caring hands. Inspired living as y0u age. What makes Pine Haven Christian Communities different is the people. We are a local care facility, not affiliated with any large corporations or businesses. Rather, we are governed by a board of directors who are representatives of 18 local churches. We are answerable to these churches, and more importantly to God, for everything we do. Our focus is the care of our residents, families and staff. Each staff member and volunteer is driven by a commitment to provide the best care possible. We are here because we want to serve. We are dedicated to providing you with the care you need, as Christ would. It is this dedication - this calling - that gives us the servant hearts and caring hands to help our residents live inspired lives as they age. 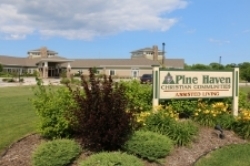 Pine Haven Christian Communities was voted Best Nursing Home and Assisted Living in Sheboygan County by Sheboygan Press readers in 2012, 2013, 2014, 2015, 2016, 2017 and 2018 Readers’ Choice competitions.